This Giving Tuesday I paid a lot of attention to the emails I received. 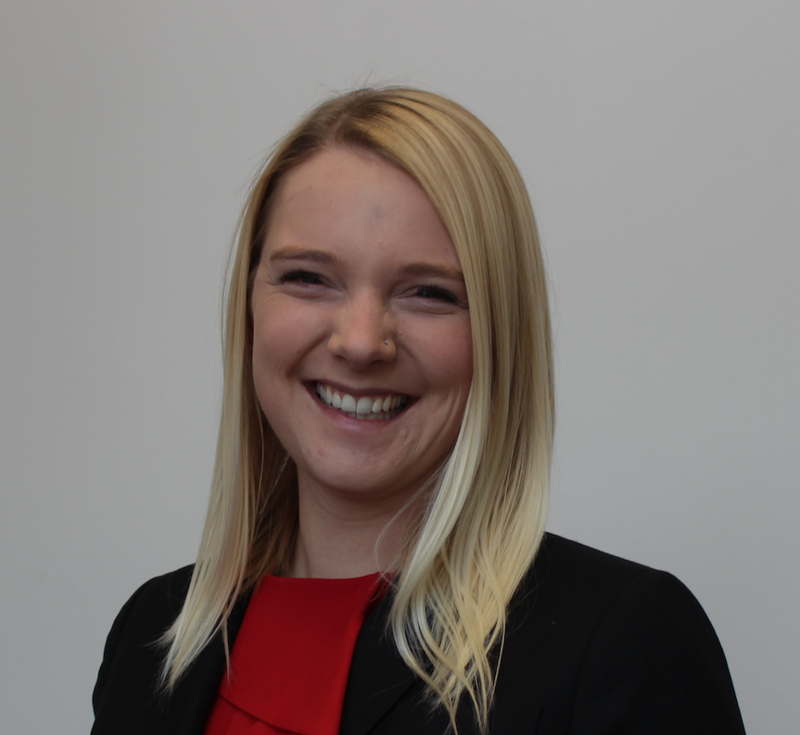 I was looking to see who was doing interesting and innovative things, who would pique my interest, and who has the most room to grow for next year. Taking this deep dive can teach us a lot about how nonprofits are using behavioral economics theories in their solicitation emails (whether they know it or not!). It also highlights the room they have (and maybe you have too!) to improve by incorporating a strong understanding of behavioral economics into their fundraising efforts next year. Without further ado, take a look at some of the emails I received this #GivingTuesday. Good: This email primes my identity as a “curious, caring person who shares the Smithsonian’s values of knowledge and discovery.” They emphasize that I understand the importance of discovering and sharing knowledge. This identity priming makes me feel like I should follow through on the action they’re requesting of me, because that would confirm that I am, in fact, a curious and caring person. 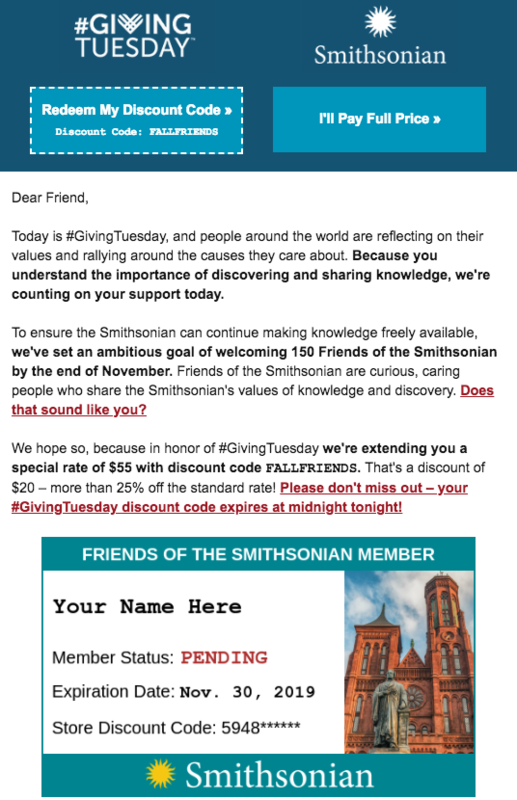 Room for Improvement: Because their giving request is called “Friends of the Smithsonian,” they can get away with addressing me as friend at the beginning of the email. However they could have personalized the email by using my name and putting my name on the membership card they display in the email. In addition, I felt like I got too many emails from them (I got 4 emails from them in 2 days). Make sure to be careful with diminishing marginal returns. Good: Having a large lead gift signals quality and boosts your message with the authority bias. 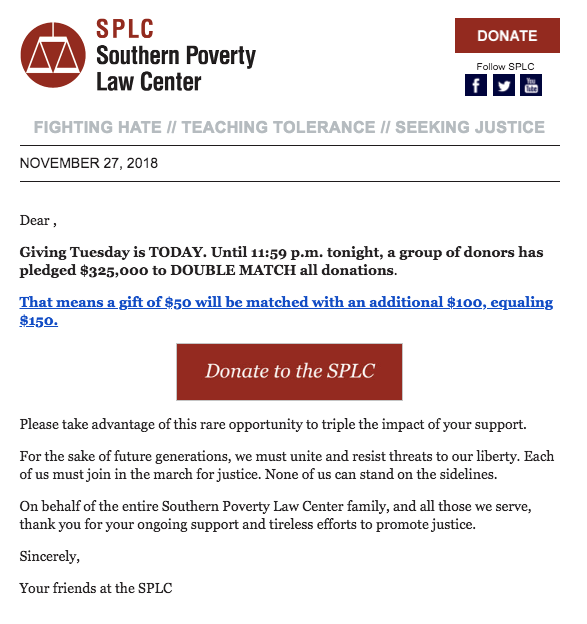 Having $325,000 for matching on Giving Tuesday indicates that SPLC is legitimate and high-quality, and that people with money (and maybe therefore people perceived to have authority) trust them enough to give them a lot of money. They also kept their email nice and short which made me more likely to read the whole thing! Room for Improvement: Contingent matching has been shown to increase contributions even more than straight 1:1 matching. Making this double match contingent on getting a certain number of new donors, or a minimum amount raised could have increased their Giving Tuesday revenue even more. In addition, the email starts with “Dear ,”. It makes it seem like they added the recipient’s name to the email copy, but for people they didn’t have a name on file for they didn’t replace it with something like “friend.” Instead, it was left blank, which looks pretty bad. Good: I am biased because I am a Spartan alum but I think the signature branding of calling Giving Tuesday “Give Green Day” really helps Michigan State University’s email stand out from the crowd. On Giving Tuesday you’re competing against all the other charitable organizations trying to coax dollars out of their supporters. Their branding makes this email more unique, piquing my interest. In addition, the message is personalized and vivid, and it emphasizes the herd of people (Spartans “coming together”) whose combined donations will make a difference. Room for Improvement: The Spartans could have used contingent matching instead of traditional 1:1 matching, as described above. They also could have provided us with a better idea of where the donations go and how they make an impact. 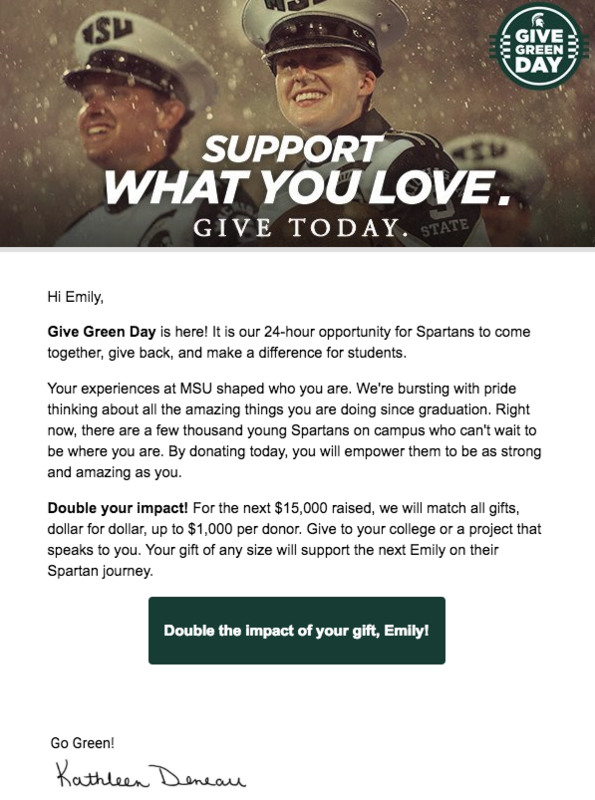 My favorite part is: “Your gift of any size will support the next Emily on their Spartan journey.” This statement makes me feel like my donation would have an impact on someone like me, which gets MSU a gold star in fundraising email copy! 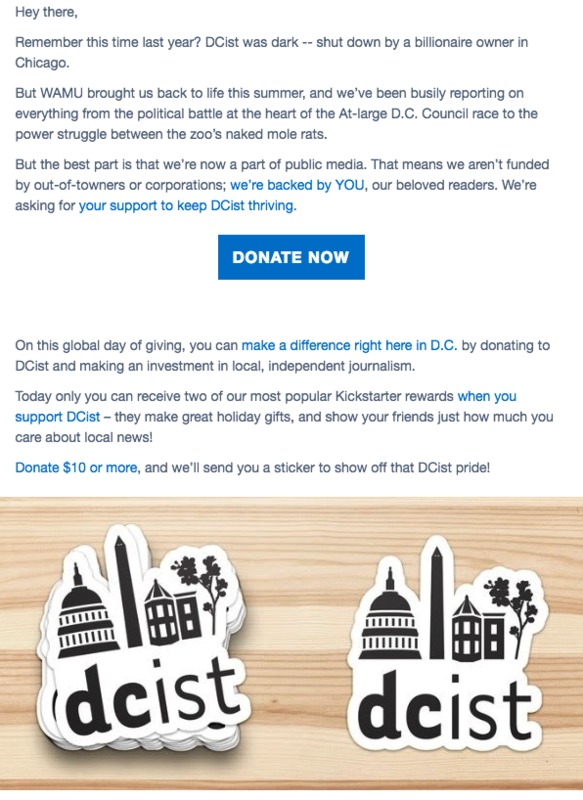 Good: Because DCist is a news organization that focuses on Washington, DC they’re able to use the closeness effect to encourage donations. They do this very artfully in this email, so it’s worth paying attention. The email tells the story of how the past owner (a billionaire in Chicago, and therefore someone we’re supposed to understand is not-close and out-of-touch) shut down DCist which was later brought back to life by local radio station WAMU. They repeat this by continuing that they’re not owned or funded by “out-of-towners,” further emphasizing that DCist is local and because you’re geographically close to it, you should support it. While we don’t often suggest offering tangible benefits to donate because you risk crowding out altruistic motivations, I think this is well-executed here. The benefits are clearly worth less than the amount you need to donate to get them. 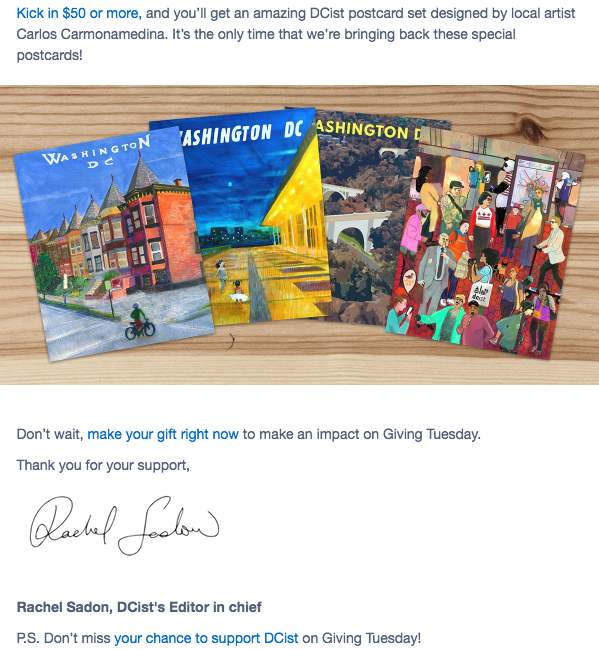 Because of this, the donor understands that their donation is really going to DCist, and the tangible benefit they get is a small token of appreciation. Their less formal language also made it seem more personal even though they didn’t use my name. Room for Improvement: They could make the email even more personal by removing some of the extras like linked text and a donate button that are reminiscent of marketing emails, and instead using naked links. 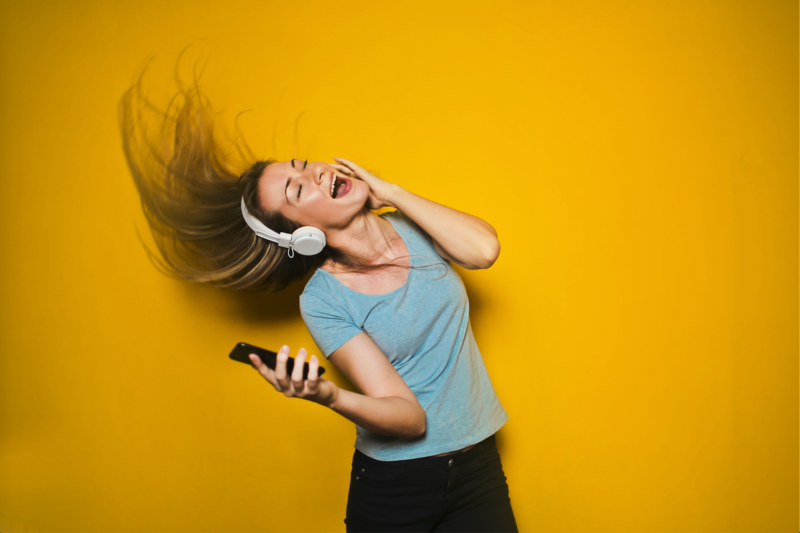 With personalization and informalization, your aim is to make the email more open-worthy and click-worthy because it looks like it was sent from a friend. Good: In addition to attending Michigan State University for my undergraduate degree, I am currently earning my Masters at Carnegie Mellon University so I received this email from them on Giving Tuesday. One of the things they did well that we haven’t seen in any of the other emails so far is using odd numbers. They say their goal is to reach 2,597 new supporters by midnight. Because this isn’t a round number like 2,500 or 3,000 our eyes don’t fly past it because it wasn’t exactly what we expected. We assume this number was chosen intentionally, and our curiosity is piqued. Another unique thing they do well is giving the supporter a sense of control and closeness in choosing where their donation goes. They are also our first example in this series of an email that used a naked URL. Room for Improvement: They should suppress student emails for those who donated. They might be doing this already but their message in the postscript indicates that they are not. There you have it! We took a look at what 5 nonprofits did on Giving Tuesday and how you can learn both from what they did well and where they can improve. Our team at Creative Science looks at everything through the lens of behavioral economics. 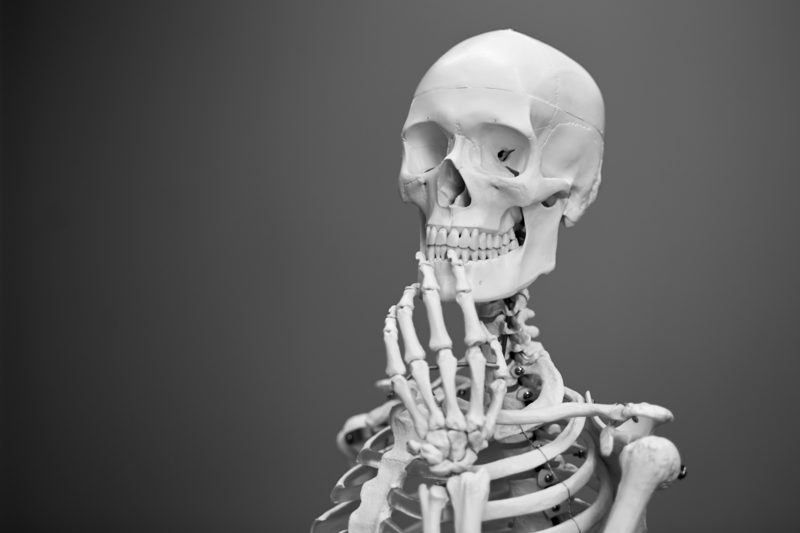 We focus on how digital experiences are HUMAN experiences at their core. This is what allows us to propel the nonprofit clients we work with forward in new, exciting, and creative ways. If you want to learn more or have a question about something you read in this post, feel free to email myself at [email protected] or our CEO Nate at [email protected]. We’d love to hear about your own Giving Tuesday experience, and give you some personalized tips and tricks to use.